The remote control's ID is set to zero by default so it can operate any compatible projector. If you want to set the remote control to operate only a particular projector, you need to set the remote control's ID to match the projector's ID. Note: You must set the remote control ID to match the projector ID each time you turn on the projector you have set it to control. Turn on the projector you want the remote control to operate with exclusively. Aim the remote control at that projector. 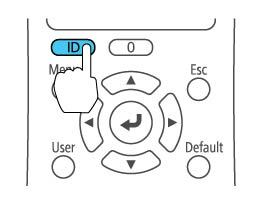 Hold down the ID button on the remote control while you press the numeric button that matches the projector's ID. Then release the buttons. Press the ID button on the remote control to check if the ID-setting process worked. You see a message displayed by the projector. If the remote control is listed as On, the remote control ID is set to operate only the listed projector. If the remote control is listed as Off, the remote control ID is not set properly. Repeat the steps above to set the ID to match the projector you want to control.